I’m really excited to be involved in a competition created by ILM & Artstation starting on the 18th of May. I’ve signed up along with a few thousand other artists! Just to be part of this will be amazing. As someone who’s created Star Wars art since childhood I’m sure it will be fantastic to work on a brief set by the actual team at Industrial Light & Magic. If rules permit I’ll post my work done here. There may only be one piece as in reality the chances of getting past the first round are extremely slim but I’m going to give it my best shot and have fun with it. All entrants will make submissions for this phase based on the briefing provided. Submissions will be judged to select “semifinalists” to move to the next phase. Semifinalists will make new submissions for this phase based on the briefing provided (you cannot reuse your submission from any prior phase). Submissions will be judged to select “finalists” to move to the next phase. Finalists will make new submissions for this phase based on the briefing provided (you cannot reuse your submission from any prior phase). Submissions will be judged to select the prize winners. The ILM Art Department staff will brief you on the requirements of each challenge at the beginning of that challenge—like you would if you were in the studio waiting for the next task. This is a simulation of working as a concept artist in a production environment. It will be fast paced. Expectations will be high. Directions may be vague and could be changed at the last minute… But hey, all in a day’s work at ILM. Some phases will be time-consuming; turnovers will be quick and may interfere with your daily schedules. 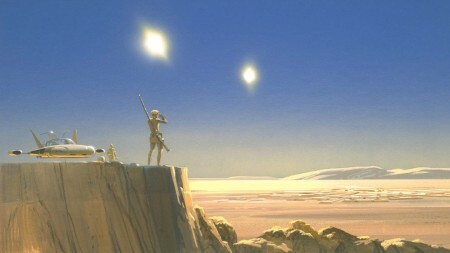 Click on the Ralph McQuarrie art below to view the competition details. I am working on a Sci-Fi story which I am also creating the artwork for. I’m not going to go into too much detail at this stage. This is an empty interior of a large room within a space station orbiting a planet. This standard area is a template so I can experiment with different types of room within this space so I’ll post some more variations as I do them. Here’s a quick digital sketch of a hangar with several space craft vehicles inside. Done using PhotoShop. Here are 3 pieces I created for the short Sci-Fi film called Mouse. The film is about a man waking up in a building with no idea where he is or what he is doing there. After crawling through a man sized mouse hole in the wall of the room he wakes up in he discovers he is not alone, and the occupants look very familiar. 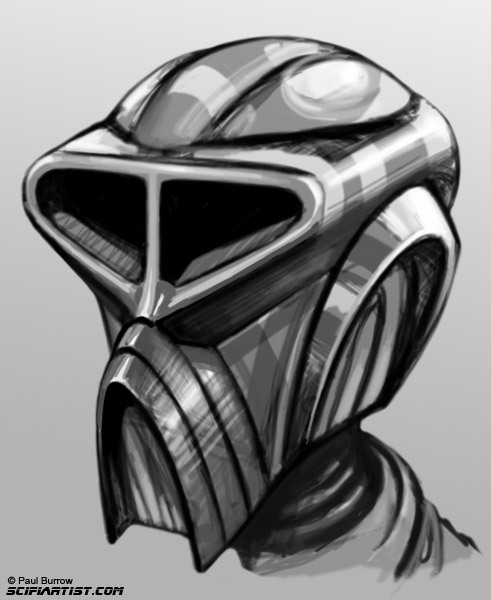 Here’s a new robot head sketch. This is a digital sketch of some robots on the run from invading persuers in the sky. I haven’t decided whether to complete this one yet or just leave it as a sketch. Here’s a new robot head I’ve just started on. I’ll post the finished version once it’s complete. Here is another concept scene from Grand Theft Robot. Here the characters Mud Doppler & Circus stand guarding an old space shuttle nose wreck in the junkyard. Here are 2 character designs. The first is a robot that originates from a pencil sketch I did over a year ago. The second is a soldier type character. 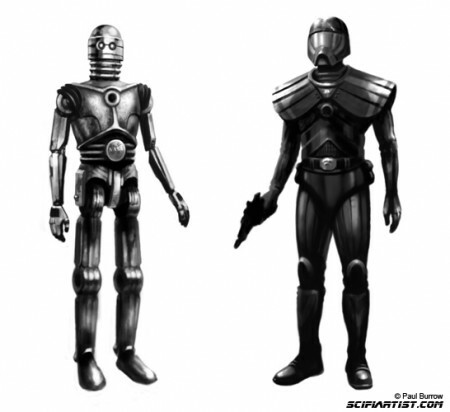 Both appear on page 1 of Grand Theft Robot. Got quite a few pieces of art to post here but no time to do it as producing the work for my portfolio is more important right now. I’ll try and post at least one a day though before heading off to San Diego next week. 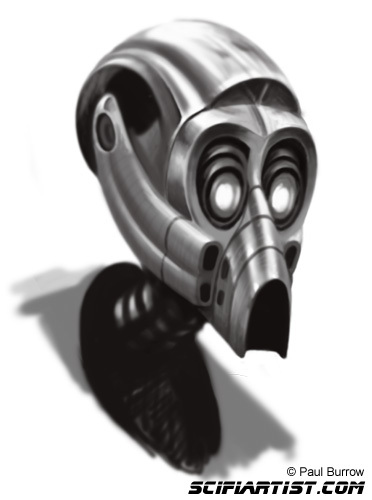 This concept piece is from Grand Theft Robot – a project I’m working on with writer Chris Reilly. I won’t go into much detail yet but it’s something I’m really excited about working on! The piece itself shows a small part of a vast junkyard of old Nasa cast offs. In the distance a city which in contrast is spotless and clean which I’ll get to draw at a later date. There’s a cat and some birds to add a bit of life to this stark bleak looking scene. A solitary robot stands motionless, pondering.